Evo & Grace: The WanderLusts: Obra Ni Juan. Theater Review. 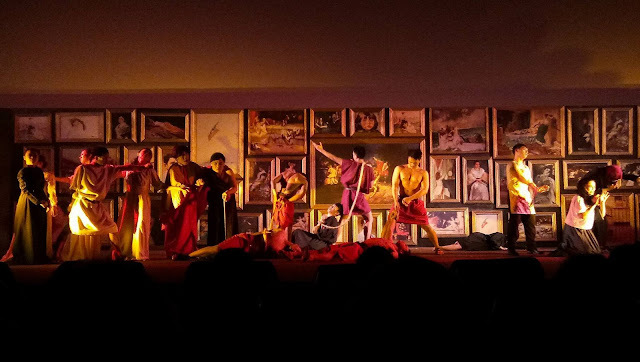 Spoliarium, an opera with libretto by Soprano Fides Cuyugan-Asensio and with music by Ryan Cayabyab was the first production I saw pertaining to the life of Juan Luna. Originally staged at the CCP in 2003 starring Robert Seña at the titular role, the opera was staged in Tribeca Performing Arts Center in New York thirteen years later. 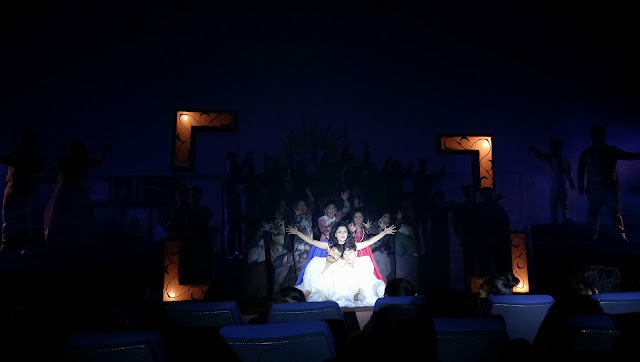 Philippine Stagers Foundation (PSF) current production of "Obra Ni Juan " was my follow-up. 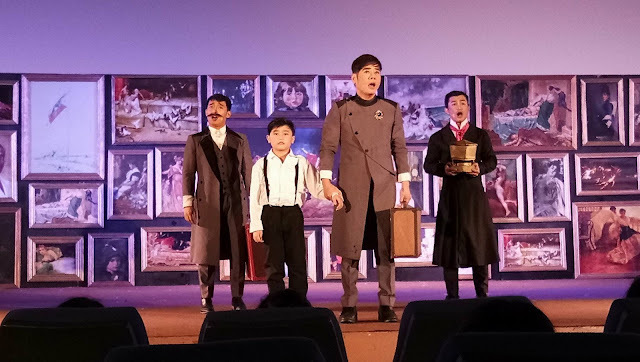 This original Filipino musical was written by Atty. Vince Tañada, PSF President and Artistic Director and with music by Peter Paul "Pipo" Cifra, president of UST Conservatory of Music Alumni Association Incorporated, marked as my first production I saw from PSF. Established in 2002, PSF is a professional theater company with an objective of helping the poor, elderly, sick and even the forgotten, has been consistently conducting free theater workshop in schools nationwide and continuously organizing outreach programs to various charities. And the only theater company with performances ranging from 100 to 500 shows per season in big venues. 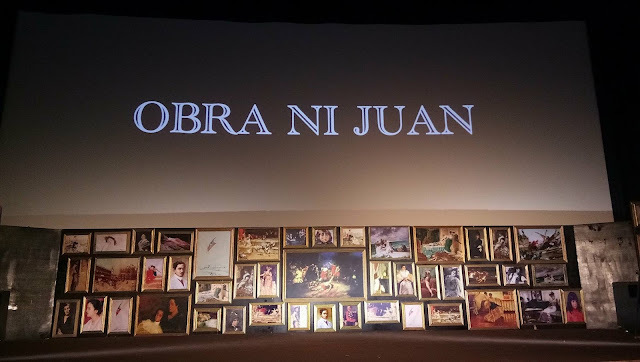 Tañada's fascination to Juan Luna was his inspiration for writing the obra. This experimental musical in two acts narratively tells the life and works of the Ilocano revolutionary painter and political sculptor Juan Luna from October 23, 1857 to December 7, 1899. 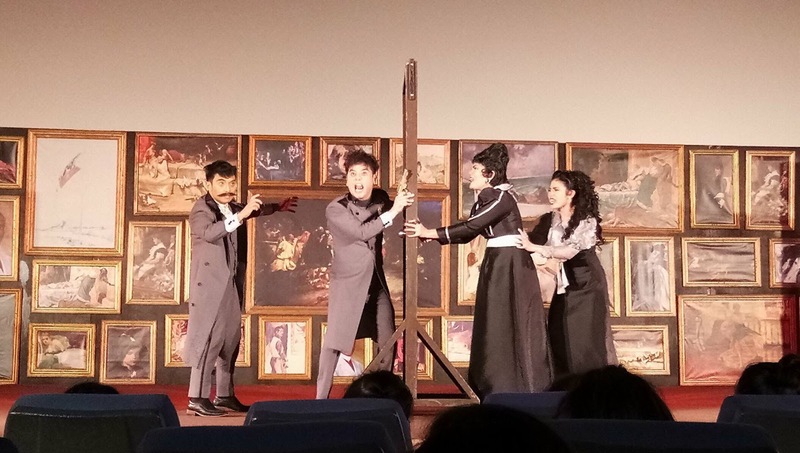 Tañada who playwright and directed the show emphasized and exposed Luna's journey spanning from the Philippines to Spain, Italy and France. His extensive research and archival collection about Luna were revealed through lines verbally or nonverbally, conveyed through songs and intepreted through dances. Not to be missed are the lines being thrown ordinarily, figuratively and idiomatically. The choice of rhetoric, symbolically and significantly gave the late 19th century realization period of this piece. Luna's masterpieces welcomed me upon entering the cinema and having a glimpse of these artwork replicas immediately tells a story. The idea of using them as backdrop was a signature spectacle, and these will be perfectly complemented if the venue is a real theater equipped with drape (main, grand or house), curtain (house or act), teasers and tormentors and even scrims, because a European period settings will be created and a European mood will be achieved. The opening scene, "Sa Biyahe Ng Barko " is a beautiful depiction about Luna's life, who was once a sailor prior to becoming an artist. Seeing the cast and the rest portraying the waves was beautiful. 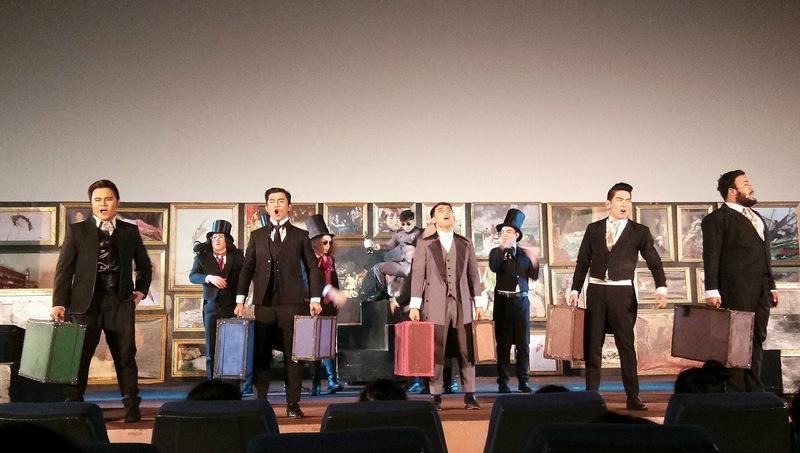 "Europa" is another thrilling musical number with Rizal, Luna (Antonio and Juan), Tavera, del Pilar, Boustead and the whole ensemble. Theatrically beautiful in terms of blocking and emphasis, those men singing and dancing with monogram classic trunk bag, I imagine them carrying those LV monogram classic suitcases. Of all the eight songs from the repertoire, that's my favorite. What a way to begin watching PSF future productions. Obra Ni Juan cast includes both PSF seasoned and regular thespians. Patrick Lubao (Juan Luna 1), Vince Tañada (Juan Luna 2), Chin Ortega (Juan Luna 2 alternate), Johnrey Rivas (Jose Rizal), Jomar Bautista (Antonio Luna), Cindy Liper (Paz Pardo de Tavera), JP Lopez (Marcelo del Pilar), Kenneth Sadsad (Trinidad Pardo de Tavera / Juan Luna 1 alternate), Adelle Ibarrientos (Juliana Pardo de Tavera), Rutchel Leonor (Nellie Boustead / Juliana Pardo de Tavera alternate), Gerald Magallanes (Antonio Luna alternate), Vean Olmedo (Paz Pardo de Tavera alternate / Ina), Rotsen Etolle (Trinidad Pardo de Tavera), Alyanna Andres (Nellie Boustead alternate), Juddy Tolentino (Leonor Rivera), Chris Lim (Haring Alfonso XII), OJ Bacor (Charles Kipping / Punong Majistrado), Zen Lizardo (Mrs. Boustead), Enzo Vilanaba (Andres Bonifacio / Jose Rizal understudy), Dean Benedict Rafols (Andres " Luling " Luna) and Carol Sarreal (Ina alternate). 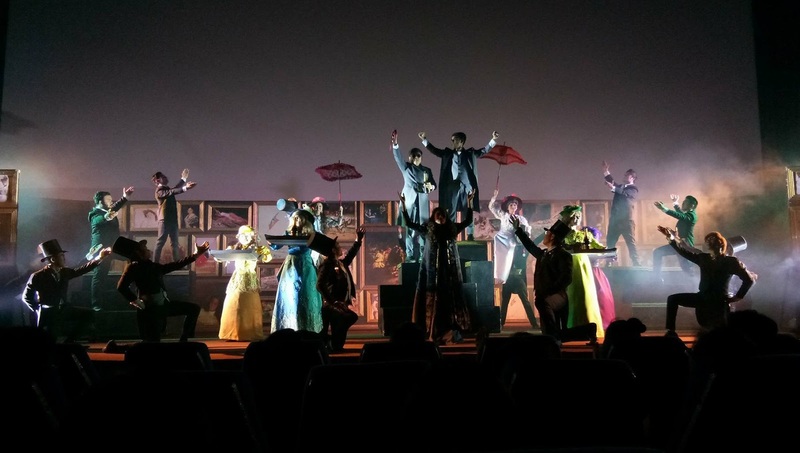 The rest of the ensemble includes Brent Martinez, Cedie Duller, Rich Bea Martin, Jeremiah Bias, Kier Posadas, Carl Vincent Millan, Pearl Belen, Justine Seclon and Kiel Najera. School plays are the best. This is the best way to fresh one's mind after the so many hectic schedules. And this is the great storyline of this play, I will love to see this.